Hey guys! Merry Christmas and happy holidays! It has been a crazy month filled with goats, goats and more goats alongside new sponsorships, water projects and much more. In the spirit of the holidays people opened up their hearts and gave generously to the project. Looking back on The Creation of Hope project just one year ago there were only eight sponsored children through the outreach project; pretty crazy how much The Creation of Hope has grown in such a short time! My dad will be being doing the update for this month because I thought that he has been slacking lately…JUST KIDDING! I hope you enjoy the December update and that you are inspired by the changes in the community! Keep it up everyone, and thank you. This was, again, a very busy month with lots of great things happening! Hello again; You spoke at our school in October of last year and then met with a small group of students who had compiled the video documentary on Afghanistan. It was an opportunity of a lifetime for them to be part of the writing process in assisting in editing your book, Wounded, and then writing the afterward. This inspired those particular students to become leaders who, in turn, inspired others to become involved in various fundraising activities through the school year. The students participated in various fundraising events. The 30-hour famine was completed by Melissa M., Ashley E., and Kianna M. The vow of silence was completed by Caleigh P., and Tanya M. Another pair of students, Jody S. and Bethany P. conducted a Red Ribbon Campaign for AIDS awareness. Tyson P. held a barbecue on a Saturday morning to help raise money for the cause. The students at our school are truly amazing. We continue to be proud of their efforts, their confidence in themselves to make change, and their budding philanthropic attitudes. We trust that you will put their money to good use, helping as many young people in need as possible. That is their wish. Of course we put this money instantly to good use as these funds are part of one of our most ambitious projects, discussed below. The second water project is in a community called Isyukoni which is near Rev. Philip’s home and is the water harvesting system. This project is to benefit the farms of about 150 families and will provide drinking and irrigation water for approximately 1,500 individuals. 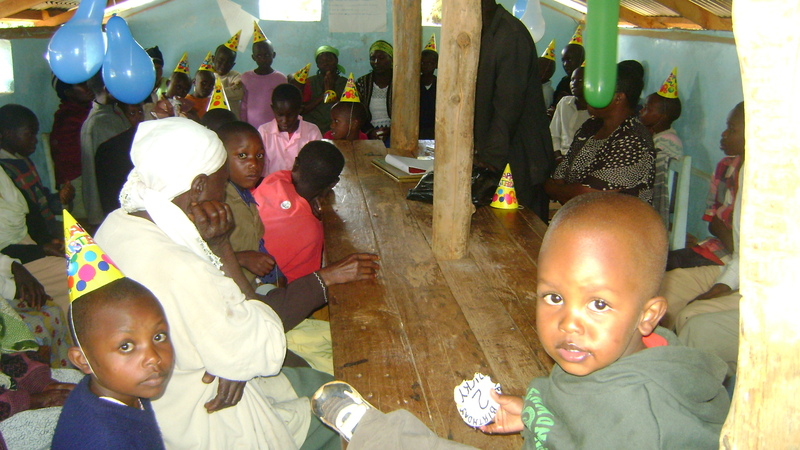 These families have become our partners in helping them to help themselves. They have provided most of the labour, gravel and sand and we’ve paid for the water technician, the stone mason, all the cement and the construction iron rods. This project captures the water from a small spring. As Reverend Philip explained to the people, he wanted to ‘stop the water from flowing to the sea.’ Just below the spring there are large rocks and boulders and using the cement and iron rods a dam has been constructed to contain the water. This allows all the water from the spring to be collected and then used for irrigation, drinking and to water their livestock. 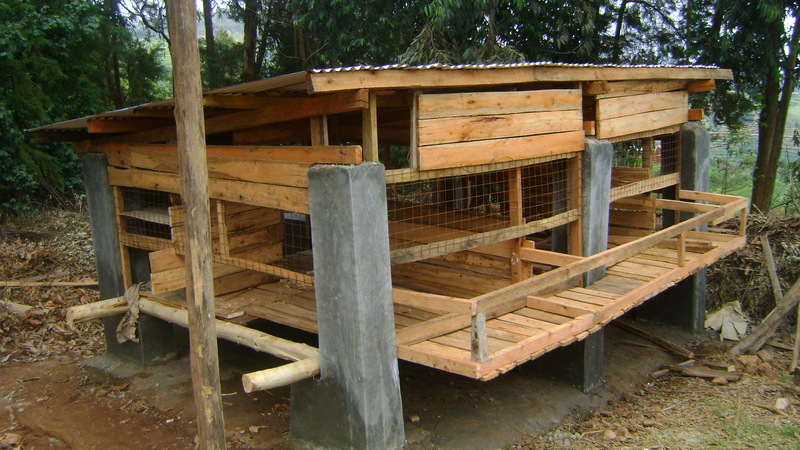 The total cost for this project was $1,900 which means that the cost per person was around $1.25 to provide water that will make a major change in raising more crops, better health, and healthier and more productive livestock! This project will be finished by the middle of January and pictures of the final product posted then. The money from this project came from Westheights in Kitchener ($425), Bath Public School ($781.10), Angus Morrison ($425.00) and William Dunbar ($269.00). Alexander Graham Bell Public School, under the leadership of Barb Kettle, has once again made a big contribution to the program. They used an I-Pod day, a snack bar at the Intermediate Christmas Dance, and a snack bar at both the Primary Christmas Concert and the Jr/Int Music Night to raise $685.30! In addition one of the staff members, Seema Shirali, donated a further $100.00. We used this $100.00 along with $85.30 from the money donated by Alexander Graham Bell to purchase 805 saplings! We’ll post how we use the rest of their donated funds when it is invested in the right project. Sharon Freeman is the teacher/librarian in Stride School in Burnaby, British Columbia. Her Community Leaders raised $300.00. This money is being used to plant 1304 saplings! In addition Sharon made a Christmas donation of $810.00 as presents for Vesna and Slav Kanjer, Linda and Bob Ford, Karen Kanderfer, Kath Mathisen, Ila and Jim Appleby, Mark Harding, Lori McNary, Sheila Mactavish, Patti Jukes, Rae Figursky, Marjan and Christine Markota, Marianne and Dino Brunato, Angela and Nick Dasovic, Monica and Tom Markota, Pam and John Hossack, Heather Mackay, Jeff Peters and for herself. Thank you so much for a Christmas gift that will keep giving! In a very related way, one of those gifted by Sharon, Vesna Kanjer donated $80.00 for two goats, one of them to be dedicated to Sharon! Marc Stevens, a good friend of the Walters family, once again made a very generous end of the year donation of $1000.00. Marc has been an ongoing supporter beginning with the involvement of Nick’s work in 2007 to build a school in honour of his Uncle, Peter Mednis. Orca Book Publishers have also provided a $1000.00 donation for the project – thank you Andrew Wooldridge for your support! Donald and Cynthia Hallman gave a donation of $200.00 – our thanks for your support! In addition many of the sponsors provided an additional donation to provide presents for their sponsored child over the Christmas period. This money will go for a variety of things including school uniforms, books, shoes and clothes, toys and sports equipment. Those sponsors will receive individual pictures showing how their generous support was translated along with letters from their sponsored child. In previous updates we’ve talked about the work being done in Saskatchewan in the Prairie Valley School Division under the leadership of Mike Berg. 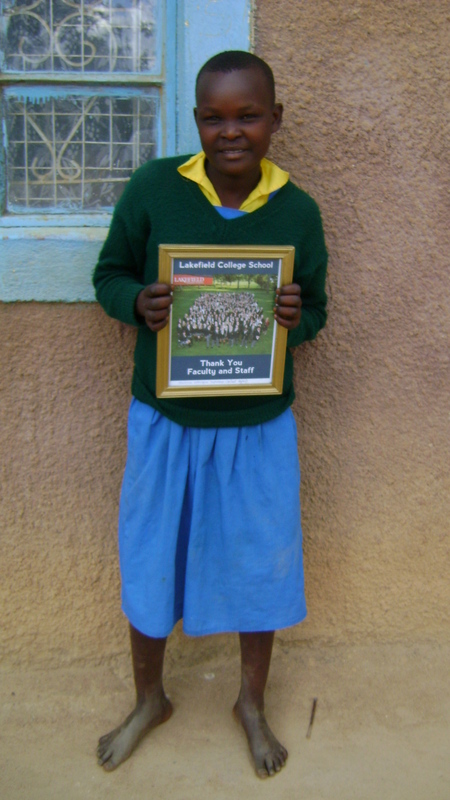 This month we received donations from two of those schools. 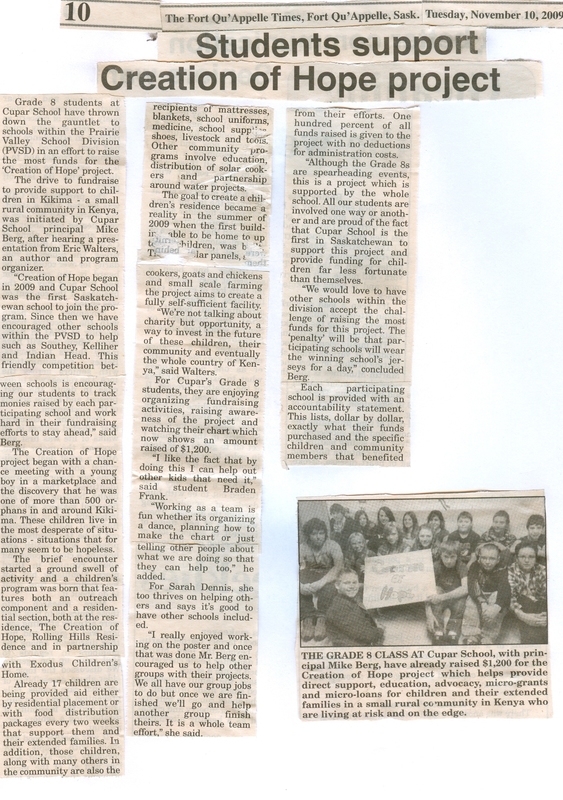 Cupar School in Cupar Saskatchewan raised $1334.82, while Robert Southey School raised $2074.00! The newspaper articles listed below tell the story of these efforts. From the beginning I’ve loved the name, The Goat Academy, because it was going to be a place where orphans learn about the care, feeding, milking and breeding of the goat they will ultimately have as their own. The goat academy is being built on Henry’s property, just beside the Rolling Hills Residence. The building will be the home of up to 25 goats. The milk will be for the children of Rolling Hills Residence to drink or will be sold and the money will help to provide for other needs within the home. Henry provided the land and the ongoing feeding of the goats and in turn all newborn goats will be his. These will be purchased from Henry by our program and given to needy orphans and their families. 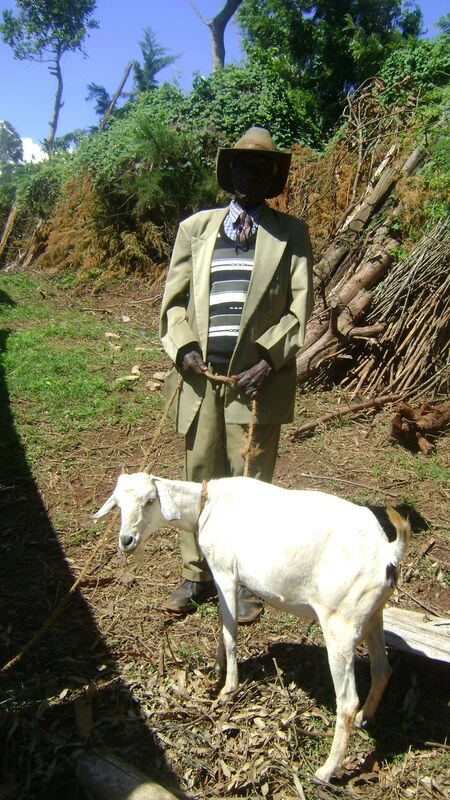 But, rather than just being given a goat, the young person will earn the goat by coming to the Goat Academy. He or she will be given training and education by Henry and the children will also bring leaves for the goats to eat and will help with their care. Once they’ve earned enough ‘goat points’ Henry will give them a goat! A kid for a kid! While Henry gave the land, the structure is being paid for by one class at one school. Ryan Rumsby and his leave-raking class at Prince Philip contributed $950.00 necessary for the construction. 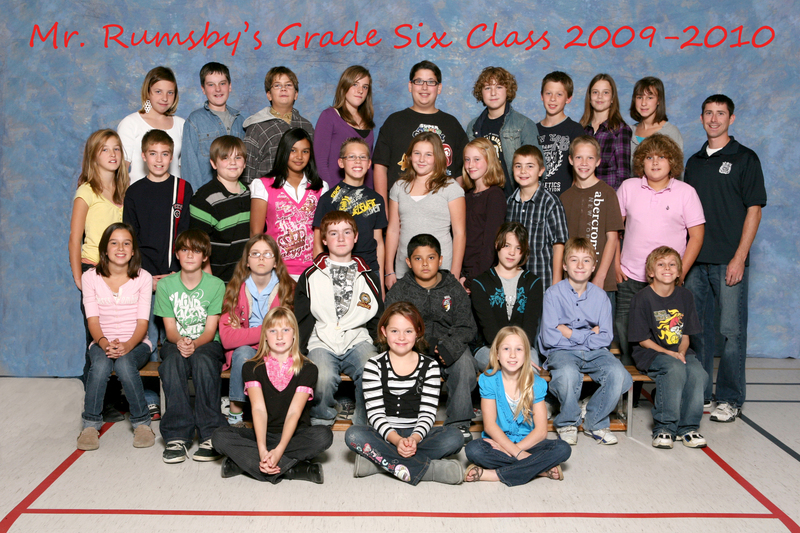 To honour Mr. Rumsby and his students the building is now called Rumsby’s Kids, which pays tribute to both his students and the goats inside. It is overwhelming and inspiring what one class of Grade 6 students under the direction of one dedicated teacher can accomplish! 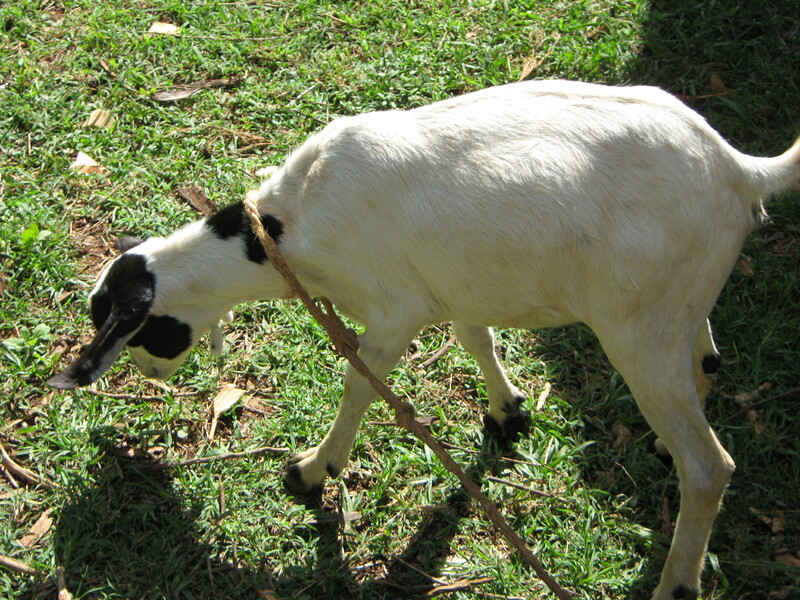 The first goats have already been purchased and the whole Academy will be fully ‘goated’ within the next month or so. 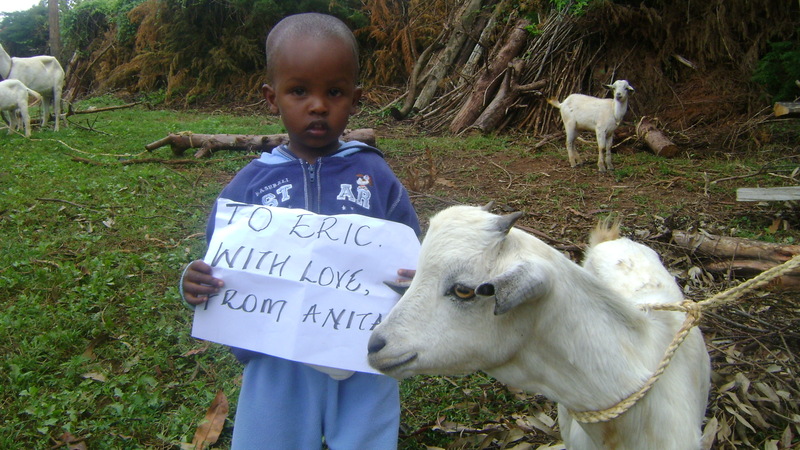 Christine Mednis donated $200.00 for five goats. Graham Fox gave $200.00 donation for 5 more goats. 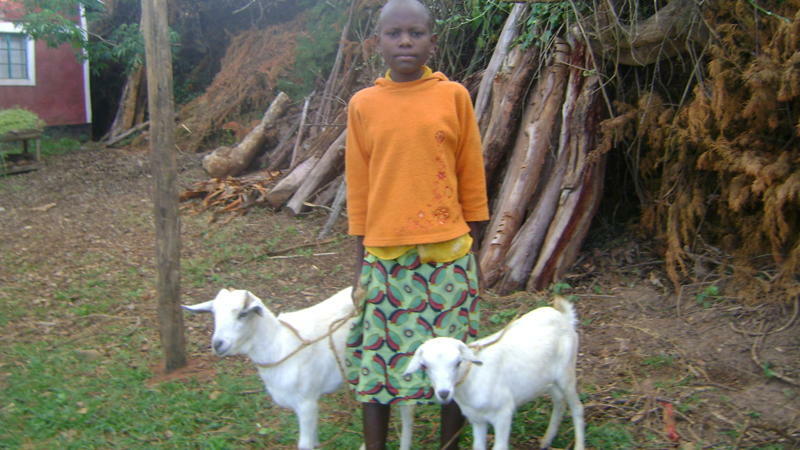 Alfhild Wikene and Karen Marie Danderfer contributed $200.00 for 5 goats. 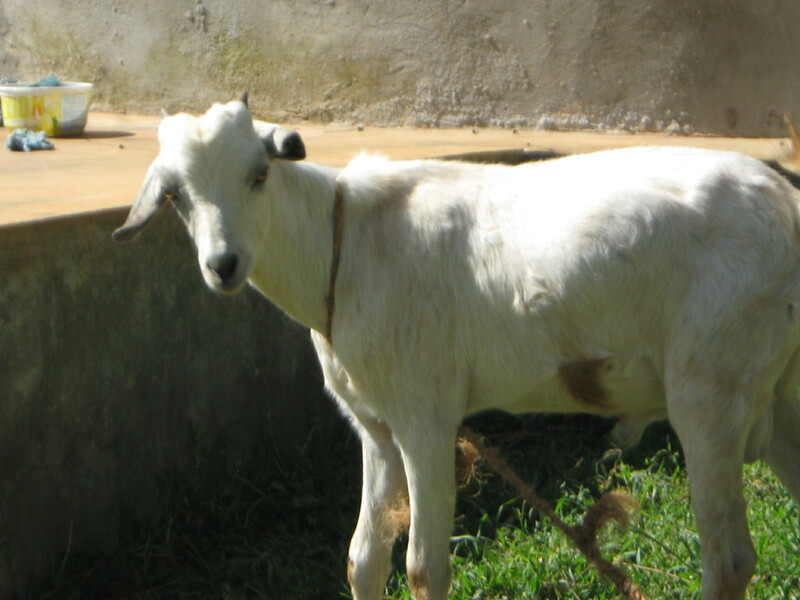 And Steve Pitt – the King of Goats – purchased two more goats. Karen Danderfer sent in $80.00 for two more goats – to be called ‘Creative’ and ‘Franklin’. Also the students of IDC 4U class at Governor Simcoe S.S. in St. Catharines under the leadership of Kim Desing-McCardle donated another $60.00 for goats. Governor Simcoe paid for this classy goat as well as paying for 87 saplings! All of these goats, along with Geoffrey Junior, are the goats who will make up the goats of the Goat Academy. 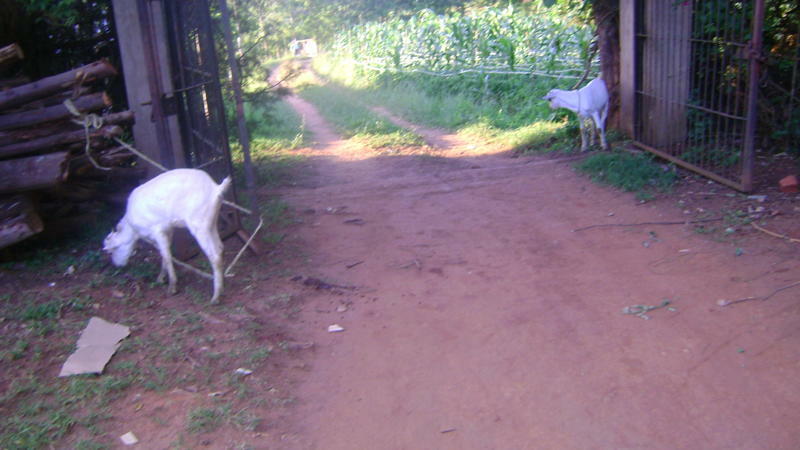 Here are the two newest goats funded by Steve who named them Eric and Anita. The one on the left does look a bit like me. In addition we received five other goats, one paid for by Beverley Mayers, a second by Val Chanady, and three that were a Christmas present from my wife, Anita, to me. The Toma family donated $150.00 in memory of their parents Beatrice and Thomas, and their brother Charles, who believed that it is everybody’s responsibility to feed the hungry. Lorraine Toma-Jones, who sponsors a program child, Mutua, also made another generous donation – she provided a nearly new laptop computer! We brought it to DuraPC in Mississauga and spoke to Mohammad – who has been of great assistance with computers destined for Kenya. He upgraded the ram, cleaned up and added programs and then only charged us for the material, donating his labour! Thanks Lorraine and thanks Mohammad! This computer will be used by the Rolling Hills Residence children in their school work and to communicate with their sponsors and students in Canada. The remaining $90.00 from William Dunbar that was not used for the water project was used to provide more saplings – 391 saplings! Students at Fairfield Elementary School in Amherstview dug into their pockets and gave $16.10 after hearing Eric speak. At Stirling Senior a girl named Annelison gave $5.00. This $21.10 purchased 91 saplings! Fairview Public School in Mississauga, under the leadership of Lorin Trevisan and her teaching colleagues, held cupcake and candy gram sales and raised $330.15. They want the money used for the well to be built at the Rolling Hills Residence. We’ve had a water survey undertaken and we’ll soon have the costs and start digging. The Fairview children will get an update in later months about how this money was applied to that project. In Kikima, when there is water there is life! Zoe gave $200.00 for families to receive tools. 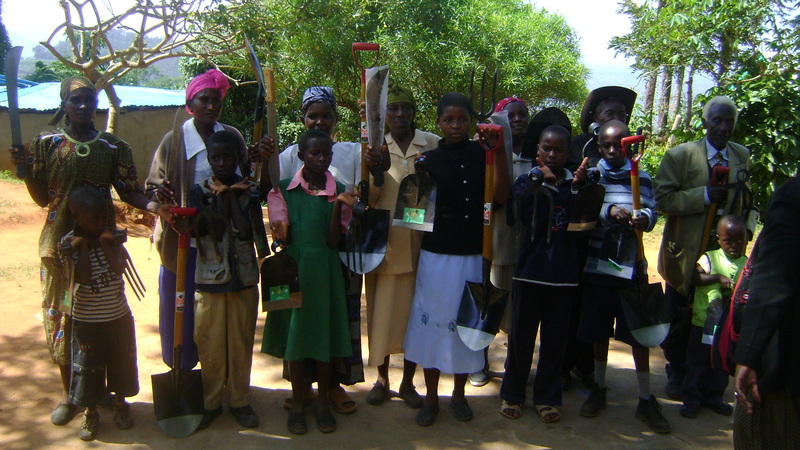 Below is a picture of some of the twelve families that each received a shovel, hoe, rake and machete. Tools allow people to become more self-sufficient – to raise their own foods and take care of their own families. Thank you Zoe for making this possible. On December 25 Rumeet Toor arrived in Nairobi and was greeted by Ruth and Henry and taken up to Kikima. Rumeet’s dream is to establish a local Faculty of Education to train teachers to teach in rural Kenya. At the present time it’s difficult to attract and keep qualified teachers in the area. We’re hoping to change that. We have partnered with Rumeet to establish this facility. 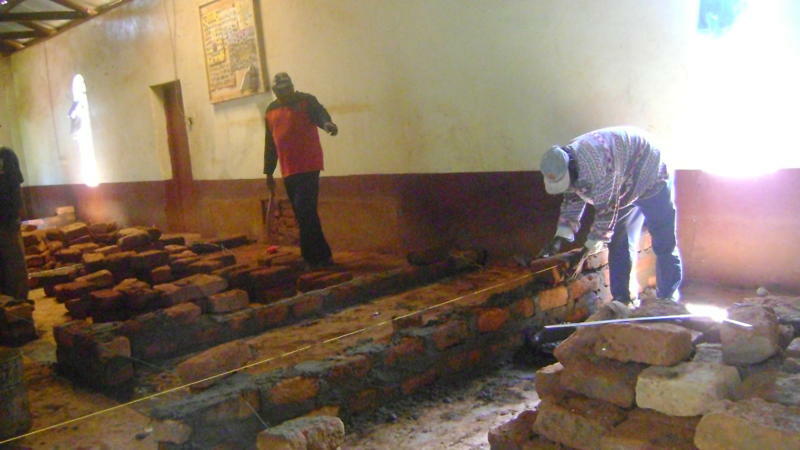 The church community came together to donate a building to be renovated to house the centre. This was an incredible act of trust and shows the strength and commitment of the people of Kikima. It also shows how much they trust Ruth and Henry and how happy they are with the work we’re doing in partnership in their community. Transparency is something that needs to exist for everything for everybody to see what’s happening. Seeing is believing . . . although sometimes believing is seeing as well. 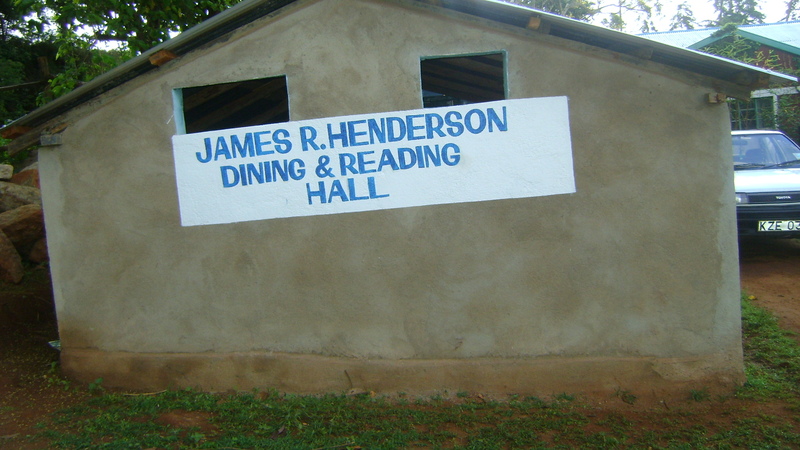 The dining and reading hall for the children’s residence was completed, but lacked the sign to honour the school that funded it. This has now been done! Thanks to James R. Henderson Public School for raising the funds! An inside picture of the James R. Henderson Dining and Reading Hall . . . and I guess a birthday Hall, as well, to celebrate Ruth and Henry’s grandson Ricky’s 2nd birthday, shared with all the children in the Rolling Hills Residence! 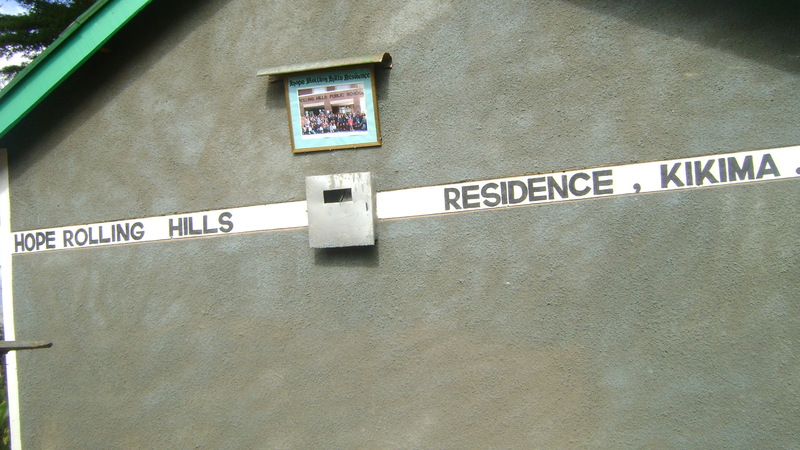 Also recently painted to honour the sponsor, is the Rolling Hills Residence – notice the picture of the Rolling Hills School children, proudly displayed! In October, McKechnie Elementary held its Book Fair. It was a school-wide fundraiser with many Grade 6 and 7 volunteers. It was held in our library and hosted by our teacher-librarian Ms. Hundal. Over the two days of the fair, the volunteers worked for five hours on one day, and three hours on the second day. The Book Fair was to raise money for library materials, but we donated $100.00 to The Creation of Hope Project. We decided to use the money for saplings. $100.00 purchased 435 saplings! Thank you so much for your confirmation and we look forward to having you on board with us! Let me introduce you to your child – Justina Kalee Kimeu. Kalee was born in 1993 and is 15 years old. Unfortunately, her exact date of birth is not known. She lives with her brother and his wife. Her brother is employed as a casual worker away from home so her sister-in-law is the one raising her. Her wish list includes books, stationery, food, socks and shoes. She is a promising girl in school and we believe her potential can be enhanced by bettering her situation, which you have chosen to. Thank you again! She is currently in standard (grade) 7, and will be proceeding to standard 8 in January 2010. If she does well in her standard 8 exams, she will then proceed to high school, which takes 4 years to complete. In her last examination, she was position 12 out of 33 students. In a related note, Sandi has once again been leading Ray Lewis Public School in fundraising. While their efforts are ongoing they have already raised $1044.15 from a coin drive and bake sale. Ray Lewis under Sandi’s mentorship were there in the beginning and their efforts continue to represent what makes this whole program run – kids helping kids. We have a pattern of staff inspiring students, and students inspiring staff. Rolling Hills P.S. 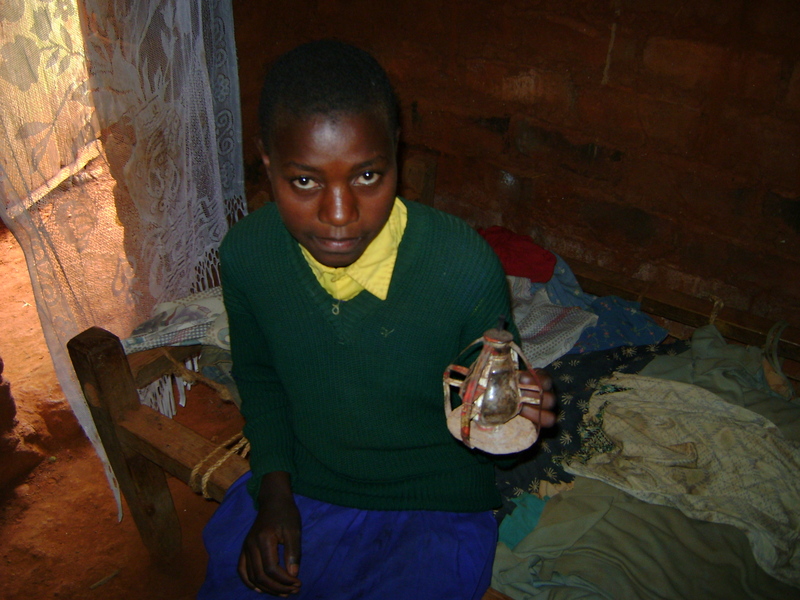 has already given so much, but now has provided a third sponsor – Sue. 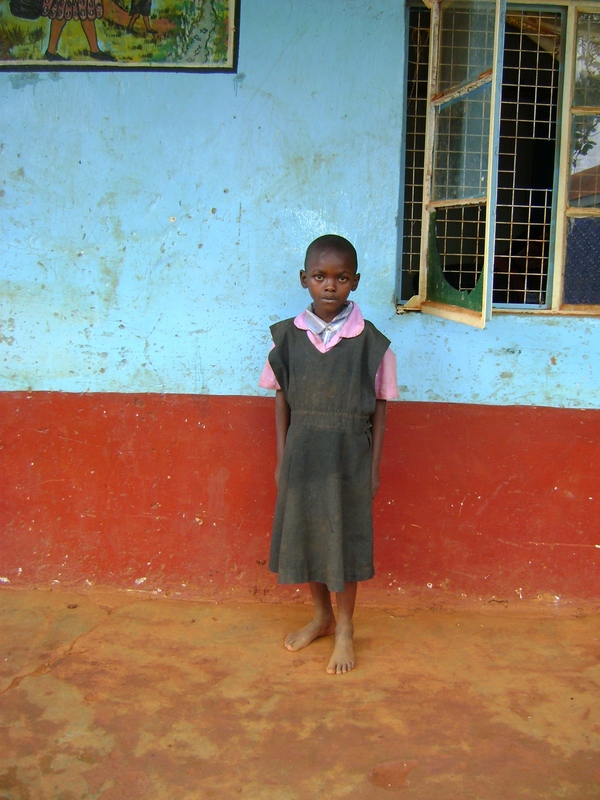 Below is the young girl she has sponsored – the child who will have her life enriched and improved through Sue and her family’s involvement. Hello Sue, Let me introduce you to your sponsor child. Mercy Mwende Katumo was born on 12th December, 1996 and she has just done a nationwide Standard (Grade) 8 exam, which will determine if she will proceed to the next class (high school) or if she will have to repeat the same class. The results are usually released by the end of December. She lives with her elderly grandmother, an aunt and four cousins. The grandfather passed away in August 2009. The aunt is the sole provider of the family and earns a meagre income from tilling other peoples’ land. Mercy shares a bed with her aunt and they have no mattress, they use empty sacks. They have no bed sheets, only 1 blanket. She has an eye problem that hasn’t yet been diagnosed due to lack of money but she says they are itchy and she doesn’t see well. Her wish list includes medical care, education, shoes, a mattress, bed, bed sheets, blanket, uniform and clothes. Kay is Ruth and Henry’s daughter and she has taken on responsibility for connecting new sponsors with their children. She is doing a great job. She’s also decided that along with a friend, they wish to sponsor a child. Below is their child, Mwikali. 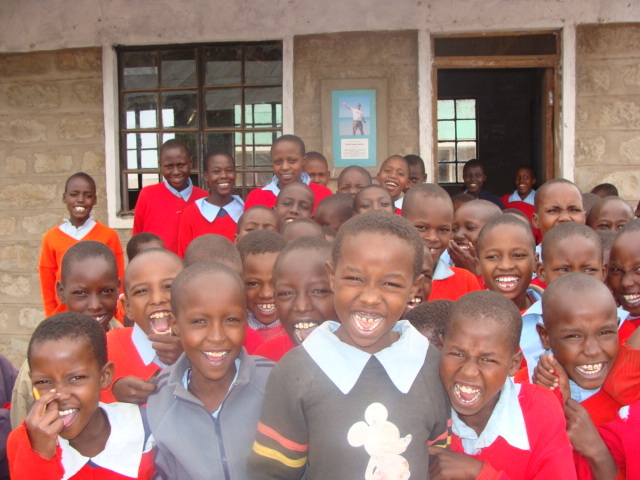 Kay hopes to tap into people in Kenya who can afford to help and sponsor other children. Our friend Bilaal is the sponsor for Mwongela, but he and his family have now decided to sponsor another child as a present for the staff and students at Lakefield College. What an incredible present – changing the life of a young person – how fitting for a school that takes this mission as one of its goal – to change lives. Below is a picture of Jackline holding a picture of Lakefield staff and students and a letter from her to thank them. 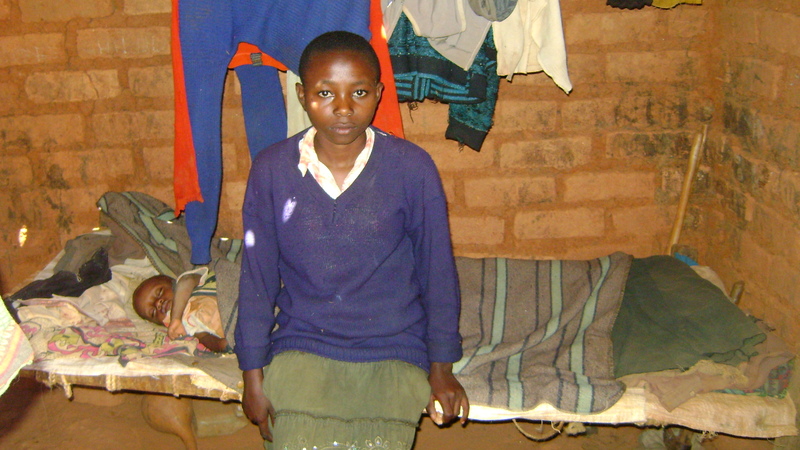 Zoe and her family – who sponsored the tool distribution listed above – have also become the ongoing sponsors of a child. His name is Benjamin. We have previously helped this very deserving family with blankets, tools and seeds. Benjamin is 15 years old and was born in 1994, his exact date of birth is not known. He has just done his standard (Grade) 8 nationwide exams which will determine if he will proceed to high school (Grade 9 – 12) and which one. The results will be released next week. He lives with his 60 year grandmother and three other siblings. 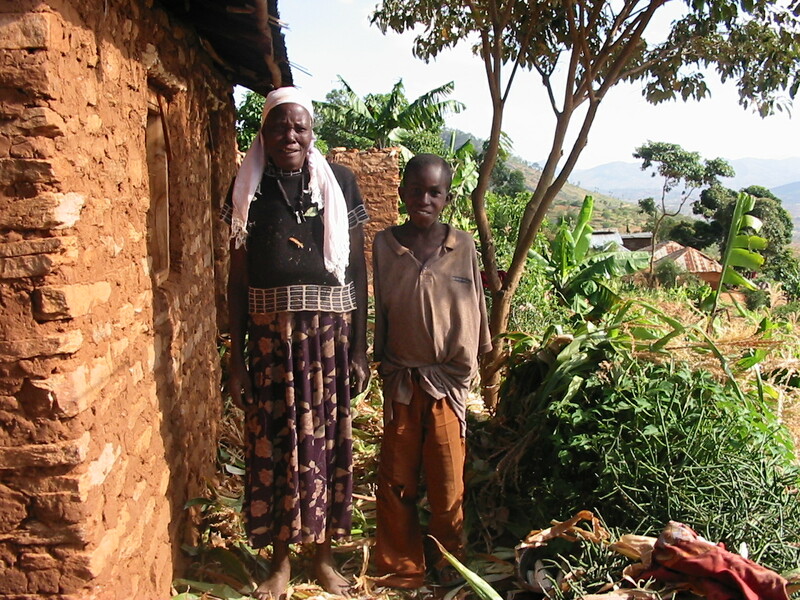 The grandmother is too old to get employment and survives by donations from well wishers and farming – their property is very small. 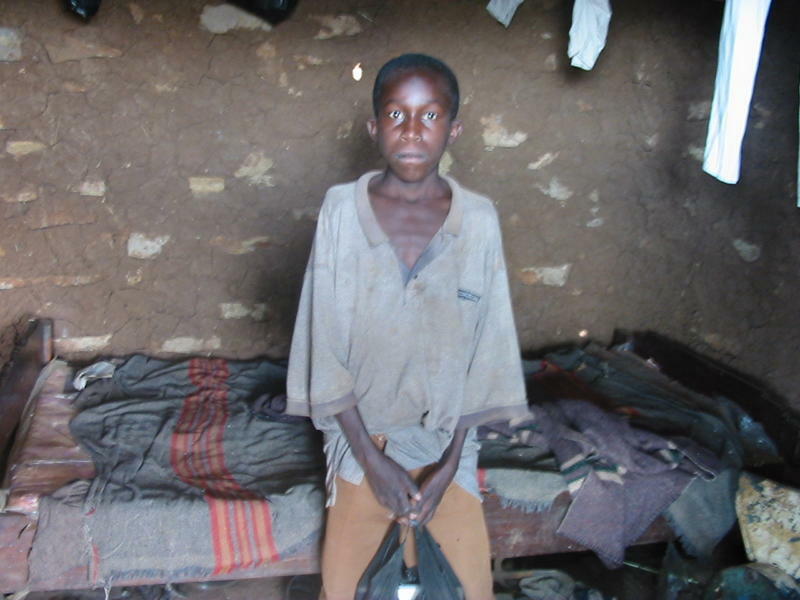 Benjamin shares his bed with three other boys and they have an old tattered mattress and no bed sheets. His wish list includes books and stationery, clothes and shoes. He will be delighted to hear that he has got a sponsor and hopefully, your taking interest in him will help him achieve his potential. Once I receive your photo, I will frame it and give it to him, and also send you a picture of him holding your picture. The children of Exodus Children’s Home had their rent paid for by the students of LaSalle Elementary School, just outside of Windsor, Ontario. 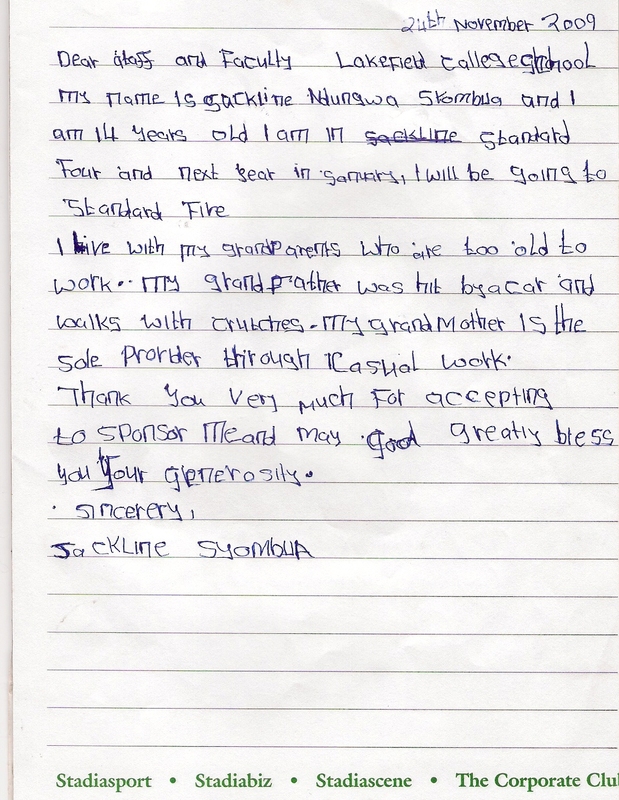 We recently had an exchange of e-mail letters between the children of the two communities. 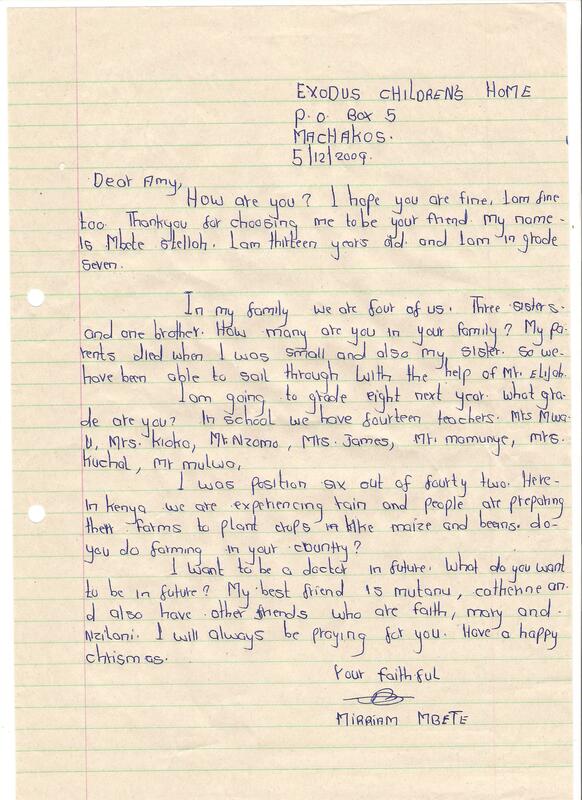 Below is a letter from an Exodus child, Mirriam, to her pen-pal Amy, in LaSalle. Both Exodus and Rolling Hills Residence have been equipped with web-cameras and plans call for the communities in Kenya and the sponsors in Canada to have live exchanges! We’ll keep you informed as this develops. After attending Eric Walter’s presentation at Medicine Hat High with his Outdoor Education class, Grant Schaber decided to become involved with Creation of Hope. The library decided to show the movie Slumdog Millionaire, one of the top ten books from the Have You Read It Yet? reading initiative, to interested students. As the focus of the reading initiative is social issues, all monies raised from the sale of popcorn is to go to Creation of Hope. Mr. Schaber took it upon himself to show the movie to his homeroom group and sell popcorn as well. After raising eighty dollars, he challenged another Phys Ed Teacher and two social studies teachers to meet or beat the amount raised. We now have over $200.00 for Creation of Hope. Mr. Schaber is continuing this fund raising activity by showing other socially aware type movies to his homeroom. Sometimes I forget to mention it, but of course, month by month the food distribution continues to take place every 2nd week. The children, and their guardians, attend and before receiving the food packages go into the fields with Henry for an hour and a half. He has been continually educating them about how to plant, care for, and harvest crops. This allows them to take pride in producing part of the food they bring away as well as developing the skills and knowledge to be able to better produce food themselves. We always talk about a ‘hand up’ not a ‘hand out’, ‘opportunity’ instead of ‘charity’. This project is not the Creation of Hope, but it is what started everything and we’re proud of it! Below is a picture of the Peter Mednis School, built by funds raised by my son Nick Walters and donated to Free the Children, in memory of his Uncle and my brother in law who died of cancer. 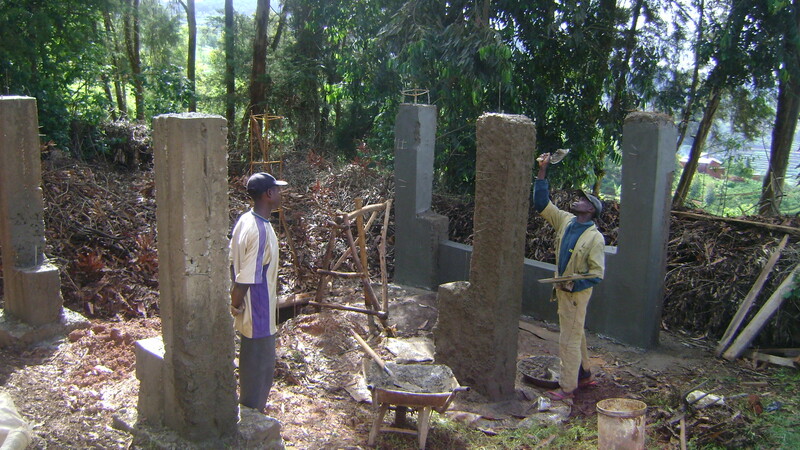 Our first trip to Kenya to help build the school in 2007 is what inspired our whole project. Part of the power of Free the Children isn’t just the work they do but the way they inspire and encourage other organizations and people to do other things locally, nationally, and in this case internationally. I feel that without Free the Children, The Creation of Hope and all that’s being done, would not have happened! That’s Uncle Peter’s picture mounted on the wall of the school.